I finally got around to watching Dexter and it quickly became one of my favorite shows to watch. I just finished off seasons 1-5 and every season had me on the edge of my seat wanting more. 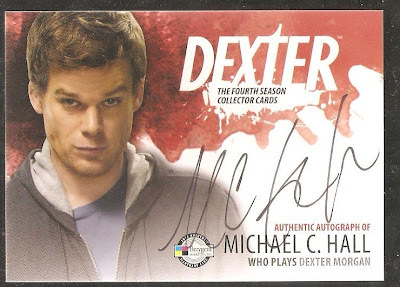 I vaguely remember Breygent coming out with Dexter cards and decided to browse Ebay and I was able to find this card. Cool to be able to get the star of the show's autograph on card. I saw there are more autographs from the main cast issued in earlier series and it would be cool to get them as well. I didn't really find any on Ebay, but it'll be a side project that I'll be working on slowly.